'The Doorman' #2 by Eliot Rahal, Daniel Kibblesmith and Kendall Goode is such a good time it's hard to put down. They've made the buddy team caught in a conspiracy with a homicidal billionaire megalomaniac not named Trump funny and inventive. Detective Flower and the last Doorman alive Henry try to convince her chief that the rich maniac is to blame for the mass murder of the doormen. The fast-paced action-packed story continues to world build and introduces a wild twist for good measure. 'The Doorman' after two issues is thoroughly entertaining from cover to cover. When we last left Flower and Henry she was out cold from a blast to the forehead. It turns out her brain is distributed all over her body so no biggie. The shooter's severed arm was just the evidence they needed to bring to her boss and open up an investigation on Moongale, the deliciously cocky villain. Things go haywire and once again they're in immediate danger. Their chemistry works on a platonic level, the human and the alien, working together to unravel this mystery. She's determined and fearless, he's smart and trusting. They also find humor organically instead of the forced quippy laughs you find elsewhere in comics. It's a testament to the talent of Rahal and Kibblesmith, especially as a team, to create dialogue and action that sounds like it came from a singular voice. Too often writing teams don't mesh stylistically and it shows in the script. Sometimes the tone changes mid-issue as though two different writers wrote independently of one another. Not so in 'The Doorman,' Rahal and Kibblesmith are of a single mind because the script is so fluid and fast-paced that there's no awkwardness or clunkiness to be found. With so much going on you wouldn't blame Goode and David B. Cooper to cut corners here or there, ease up on the backgrounds, or use a limited color scheme. It's just the opposite, each panel is chockfull of detail with bright varied colors per scene, there's even birds on a window sill even though no one would have cared if there wasn't. It takes a conscientious professional to build out a story by going above and beyond. Cartoonish, kinetic, with great character designs and constant action, Goode lays out an irresistable tale with magnetic craftmanship. 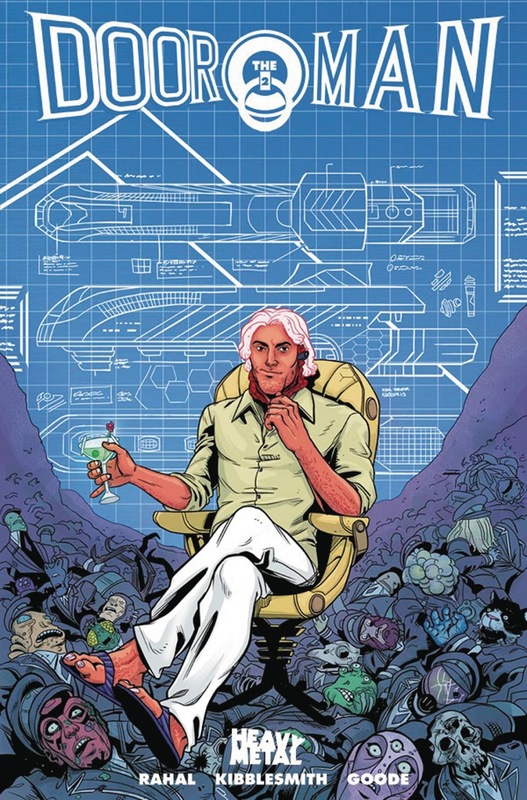 'The Doorman' #2 gives Heavy Metal another fantastic sci-fi adventure along with 'Interceptor' that is pure entertainment. Rahal, Kibblesmith, Goode and Cooper have a winner on their hands. It feels like a true extension of the first issue filled with more action, humor, and clever twists. Just when you think you have it all figured out, there's another dramatic turn that will drive you nuts because you'll have to wait another month. Make sure you add this to your pull list so you don't miss it.